Oxford sixth formers take the Champions 2016 title - congratulations Magdalen College School! from left to right: teacher Dr James Panton; students Tom Bates, Joel Stanley, Jake Deans, Isaam Alvi and Tom Gould. Magdalen College School, Oxford, beat 11 schools from across the UK to win the Academy of Ideas Debating Matters National Final at the Museum of London. They impressed all judges and schools with their sharp ideas, broad approach to the topics and outstanding research winning all four of their debates to be crowned Debating Matters National Champions 2016. The Debating Matters Competition is supported by primary funder the Wellcome Trust. The Greater London Authority hosted an opening reception on Friday 1 July at City Hall. Secretary of State for Schools, Nick Gibb MP, and Deputy Chair of the London Assembly, Jennette Arnold OBE AM, addressed the students and invited guests. Magdalen prepared for over a month for the National Final weekend, and in their opening debates posed the arguments that the UK should introduce a sugar tax and that Britain should pay reparations for the slave trade. In the semi-final Tom Gould and Joel Stanley beat Douglas Academy by arguing that humanity should fear advances in artificial intelligence. Tom and Joel then triumphed in the final debate against Hutton Church of England Grammar School, former competition champions, arguing there should not be limits to free speech on social media. Judges also awarded Tom Gould the prestigious Best Individual award due to his exemplary performance in the semi-finals and final, and intelligent questions from the audience. The Debating Matters team would like to thank all the judges and speakers who helped to make the weekend so challenging and stimulating for the students who attended, but most importantly we would like to take this opportunity to thank all of our sponsors and supporters for their commitment and belief in the Debating Matters Competition. Thanks to: the Wellcome Trust, Hodder Education, UCAS, BAE Systems, CIPR Corporate & Financial and CIPR Public Affairs, the Medical Research Council, The Chartered Institute of Taxation and Mattioli Woods plc for the commitment they have shown to the competition, and of course to the Greater London Authority and the Museum of London for hosting the National Final events. Honourable Mentions: Tom Bates, Magdalen College School, Oxford; Laura Bramall, Repon School, Derby; Lauren Hall, Queens’ School, Bushey; Issac Hempstead-Wright, Queen Elizabeth’s Grammar School, Faversham; Keith Mather, South Hunsley School and Sixth Form College, South Hunsley; Jane Prinsley, Norwich High School for Girls, Norwich; Milo Simpson and Stan Whittaker, Exeter College, Exeter; Josh Tulloch, Kingsdale Foundation School, London. 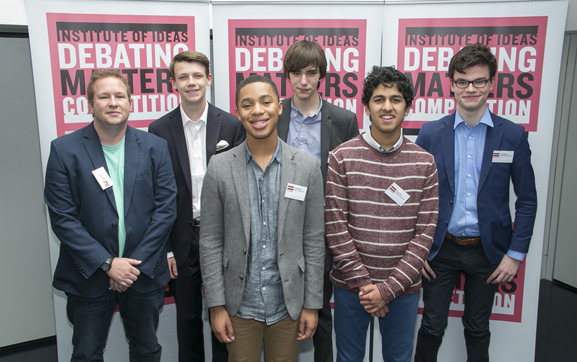 For media enquiries about the Debating Matters National Final 2016 please contact Adam Rawcliffe on 020 7269 9231. For all the latest news on the competition, images from the National Final and much more, follow us on Twitter and Facebook. And if you want your school to be crowned Champions 2017, take part! National Final photography by Chris Sharp.